Electric cars offer no clear fuel cost savings relative to efficient internal combustion engine (ICE) options. CO2 and tailpipe emission benefits are also insignificant relative to efficient ICEs. 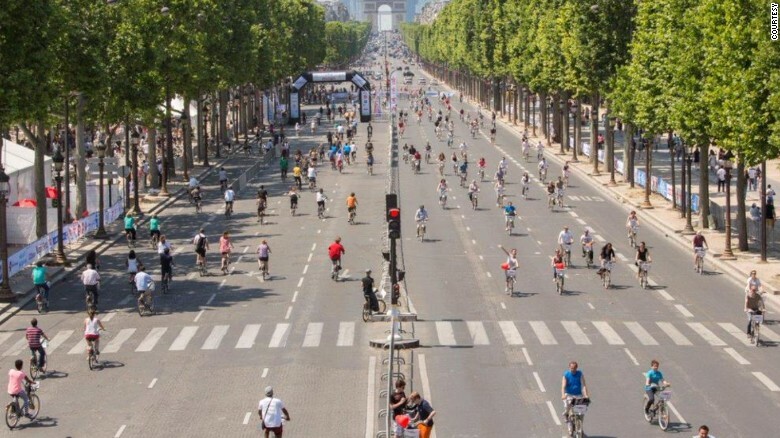 Attractive car-free lifestyle options will reduce demand for city driving patterns that are best suited to electric cars. 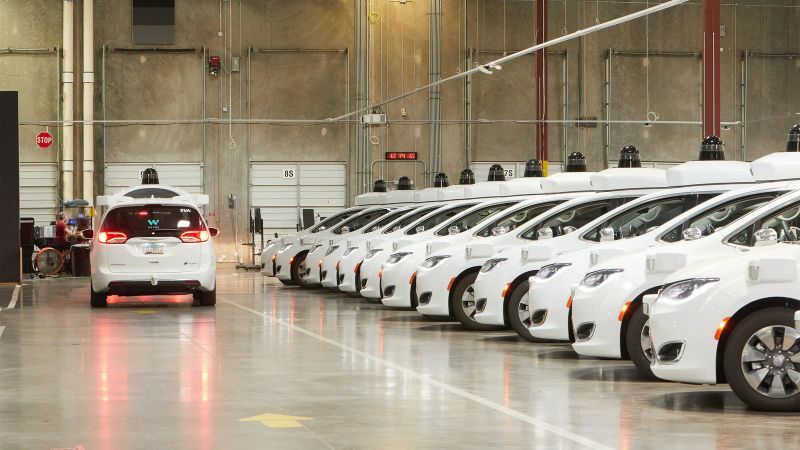 Autonomous driving technology could benefit the ICE more than it benefits pure electric drive. Electric car mania is sweeping the globe and people are predicting the imminent death of the internal combustion engine (ICE) with increasing vigor. Even The Economist recently got in on the act. However, some simple objective analysis quickly shows that there is limited substance behind all the hype. I should establish right up front that I do not dispute that battery electric vehicles (BEVs) will see impressive growth over coming years. The only point I wish to make is that their potential for achieving the rapid and economical emissions cuts the world so badly needs is very low. Money spent on electric car technology-forcing is therefore, in my opinion, a bad investment at a time when we really cannot afford bad energy investments. This article will outline the most important arguments in this thesis. One of the primary arguments for electric vehicles is lower fuel costs. 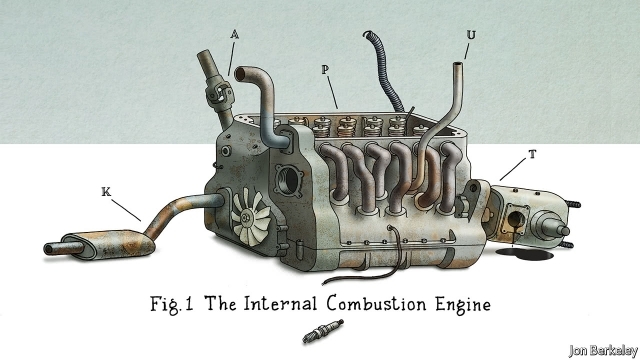 Yes, the electric motor is inherently much more efficient than the internal combustion engine (ICE), but the generation and distribution of electricity is also much more expensive than the production and distribution of gasoline. And no, the fuel costs of electric vehicles should not be compared to the woeful American average fuel economy of 25 mpg. Electric vehicles are built for maximum efficiency so that they can get more range out of a given battery pack. They should therefore be compared to ICE cars that are built for maximum efficiency such as the Toyota Prius and the Hyundai Ioniq (both pushing 60 mpg). Obviously, these highly efficient ICE cars present the best benchmark for electric cars, given that they are also promoted as eco-friendly solutions with low fuel costs. For example, comparing the fuel costs for the Hyundai Ioniq hybrid and electric versions shows only a small advantage for the electric car (which is $5000 more expensive with a battery pack of only 28 kWh). If electricity was taxed the same as gasoline (to pay for things like road maintenance), fuel costs would be essentially identical. Besides, at these efficiency levels, fuel costs are typically about 10% of total car ownership costs. A 10% fuel cost advantage one way or the other will therefore translate to a negligible 1% ownership cost differential. 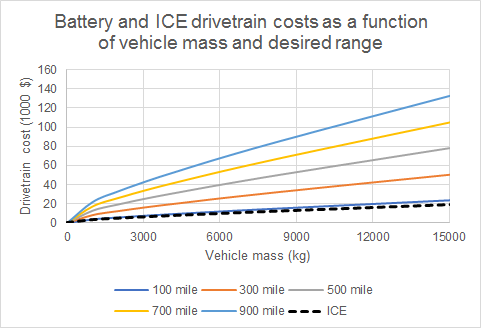 As discussed in a previous article, ICE and BEV drivetrains will probably end up with efficiencies around 50% and 80% (including charging losses) respectively in the long run. 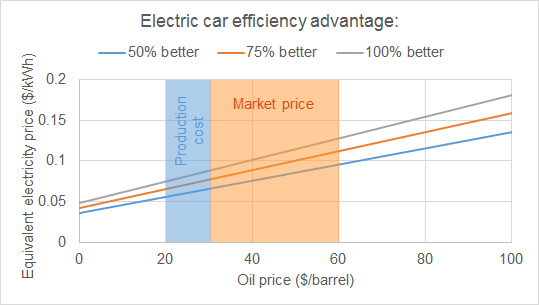 The following graph was created to show the electricity price where BEV fuel costs reach parity with ICE fuel costs for a range of BEV efficiency advantages. It is clear that BEVs enjoy no obvious fuel cost advantage under normal oil prices of $30-60/barrel. Arguably, the comparison should rather be made to average oil production costs ($20-30/barrel), given that the difference between market prices and production costs funds a large chunk of public spending in many countries. In this case, from an overall global perspective, fueling efficient ICEs can be significantly cheaper than fueling BEVs. The CO2 emissions of BEVs relative to ICEs depends primarily on the electricity mix that fuels the BEV. In addition, the BEV battery leads to higher embodied CO2 of about 100 kg/kWh. 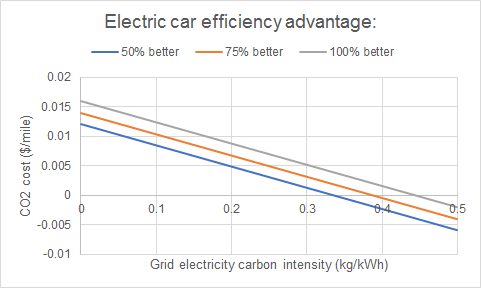 The graph below calculates the electricity CO2 intensity required by BEVs to emit less CO2 than ICE cars for the same three efficiency advantages displayed above. Future battery embodied CO2 is assumed as 50 kg/kWh and calculated on a 60 kWh battery pack lasting 250000 miles. Given that the latest IEA New Policies scenario projects an average global electricity carbon intensity of 0.42 kg/kWh by 2040 (currently 0.56 kg/kWh), it is clear that BEVs again don’t offer any fundamental advantage relative to efficient ICE cars. Beyond 2040, electricity carbon intensity will continue declining, but biofuels and synfuels will also reduce the carbon intensity of ICE fuels. If the world finally manages to implement proper technology-neutral climate policies, CO2 intensity of electricity will fall faster. However, this will increase electricity costs, reduce oil prices and also accelerate the development of low-carbon fuels, thus keeping the ICE competitive. In any case, at these efficiency levels, even high CO2 prices do not greatly impact car ownership economics. The graph below calculates the CO2 cost savings of BEVs at a CO2 price of $150/ton and a future BEV efficiency of 0.24 kWh/mile (including charging losses). Given that car ownership costs about $0.6/mile, potential BEV CO2 savings relative to regular gasoline are in the order of 1%. The story is similar for other emissions. Local tailpipe emissions (e.g. NOx and PMs) from efficient ICEs are very low. For example, the graph below shows that only about 10% of total NOx and PMs of the Prius comes from the tailpipe. Incidentally, the total NOx and PMs tally for the Nissan Leaf is 75% higher than the Prius on the same site. Battery electric drive is fundamentally best suited to vehicles driving shorter distances, i.e. commuting and general city driving. The longer the required range, the worse the economics get, especially for larger vehicles. 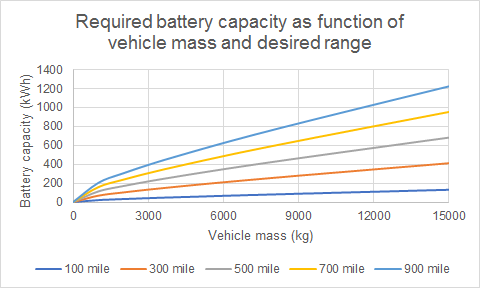 A battery pack size estimate is given below for vehicles of different sizes with different range requirements. BEV attractiveness fades quickly with greater range requirements due to large battery pack costs. In addition, a greater range requirement generally means highway driving at relatively constant speeds where the ICE is at its best. For example, state of the art diesel truck engines operate at 47% efficiency and can potentially reach 55% efficiency with improvements offering a relatively short payback period. Future specialized highway cars will offer similar efficiencies as discussed in an earlier article. 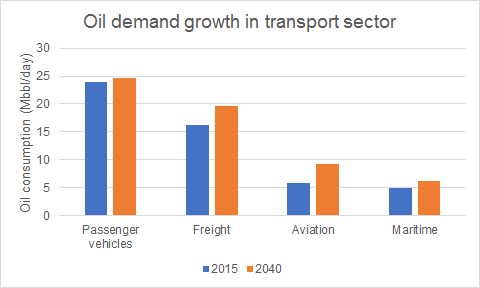 These applications within the ICE comfort zone will be responsible for most freight and passenger transport energy requirements by 2040 shown below. Fast charging stations offer a partial solution, but will substantially increase fuel costs for BEVs. Fast chargers themselves are relatively expensive, imply peak-time charging with higher electricity prices, and may require expensive electricity transmission to remote locations. For example, Tesla’s superchargers now cost customers in California about $0.20/kWh – a price equivalent to $3.36/gal (excl. taxes) in a current hybrid that is half as efficient as a BEV. Tesla claims that they will make no profit at this price and long queuing times at supercharging stations suggest that more expensive capacity buildouts are actually required. More pessimistic assessments easily arrive at substantially higher fast charging costs. An additional very important trend is that telecommuting, small electric vehicles and doorstep delivery services will steadily displace short-distance car travel over coming decades. People will eventually realize just how silly it is to haul 2 tons of metal over 50 miles of roadway day after day to go and do computer work that could be done just as efficiently from a home office. I have previously estimated the truly enormous economic benefits of telecommuting and small electric vehicles in this article. The shear magnitude of these advantages and the great attractiveness of car-free neighborhoods and city centers will eventually take away most of the short-trip BEV sweet spot. The greater capacity utilization potential offered by autonomous vehicles has led to great optimism regarding synergies with BEVs. Unfortunately, this optimism is unfounded because no clear fuel cost advantage exists relative to the highly efficient ICE options that would certainly be deployed for such high-utilization applications. If anything, full autonomy will favor ICEs because traffic flow will be much smoother, greatly enhancing ICE efficiency and longevity. The clear BEV advantage of strong and efficient acceleration will be negated because autonomous vehicles will strive to minimize g-forces. In addition, high-utilization autonomous vehicles will regularly travel more than 300 miles per day, requiring either a costly large battery pack or lots of costly fast chargers that increase daytime peak load. 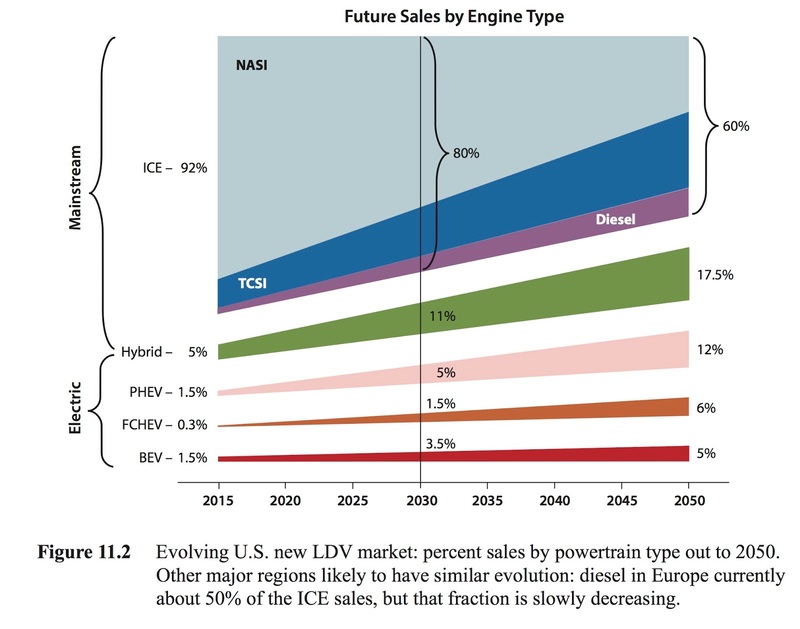 The next article will describe how ICE and (potentially) fuel cell vehicles might adapt in the longer term future to maximize efficiency, while minimizing costs and emissions. As a result, these vehicles will remain highly competitive with BEVs even as battery costs come down. 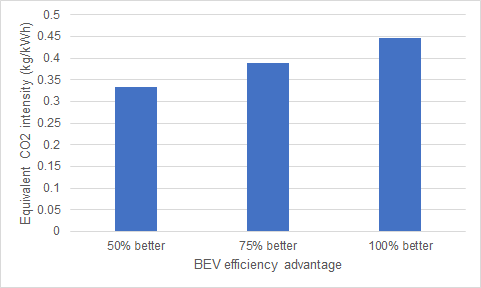 The current deployment of BEVs in the US at a time when subsidies cover the entire battery pack cost gives a rough idea of how this could turn out: Good performance in the luxury/performance segment where battery pack costs are moderate compared to overall vehicle costs and rapid acceleration is highly valued, but poor performance in the mass-market where customers are mainly interested in low costs and convenience. Sure, there are many parameters in the decision. However, we really need to look a little more at how we will generate the electricity for the coming minor revolution towards electric cars. Else we will just move the pollution from the cities to elsewhere. In my opinion we have to go forward with much more nuclear in order to reduce pollution – both locally and globally. Or, to say it more directly: We have to loosen our self from what I dare to call the Green Iron-grip. Only until the highways are able to transfer power into passing vehicles. A great article, that pulls together a lot of issues that are being fudged by pro-EV fanatics. If all were wind and solar and EVs, according to Jacobson, how would evacuations take place with power outages in Florida? Folks would be stuck by the millions, deaths would increase. I wrote this article about a year ago, then rewrote it, etc. It covers much of the same issues, but it show the numbers. There are a couple of things that this analysis skipped over, and they’re pretty big issues. At US electric prices of perhaps 15¢/kWh cost is about even. Pre-Harvey US gas prices were about $2.35/gallon; the 55-MPG car costs $4.27 in energy per 100 miles, while the PHEV costs $4.29. Post-Harvey, the PHEV is cheaper to run. Then there’s energy security. Petroleum prices can yo-yo all over the place, and delivery to the East coast was disrupted by Harvey even before Irma hit. Electric generation in the continental US runs either on domestic supplies or easily-stockpiled imports like uranium. To me, this sounds very expensive. Do you have any estimation of how much such a system will cost or what the efficiency of the wireless charging will be? I struggle to see how this will be cheaper than current supercharger costs, thus making EVs substantially more expensive to fuel than efficient ICE cars. Sure, embodied carbon of batteries will go down in the future, but we will wait for a very long time before it goes substantially below 50 kg/kWh. In any case, under the assumptions in the article, the battery embodied carbon only contributes about 0.05 kgCO2 per kWh of stored energy over the lifetime of the battery, so it is already a reasonably small effect. I agree that plugin hybrids can be interesting, but the fact is that global electricity carbon intensity is still about 0.56 kg/kWh, so it will be a long time before they genuinely become a better climate change solution than efficient ICE cars. Energy security is an important consideration, but, as I quantified in an earlier article, this benefit is also rather small: http://www.theenergycollective.com/schalk-cloete/2383486/electric-cars-m.... Hopefully the world will continue to gradually become a more cooperative place over coming decades, thus further reducing the importance of energy security. On a related note, plug-in hybrids are interesting in that they give consumers some fuel flexibility. If gasoline prices are low, the car can simply be used as a regular hybrid, but when gasoline prices rise, electricity can be used for most driving. Even just moderate penetration of such flex-fuel vehicles can provide enough demand elasticity to ensure that oil prices very rarely spike. I mention this point in the follow-up article coming soon. As mentioned right at the start of the article, I acknowledge that EVs will become an important part of the mobility market. I just think that the hype around the idea that EVs will cause total disruption like digital photography or the smartphone is completely unfounded for the reasons outlined in this article. The prime mover in a hybrid is an ICE, so there is no problem with this comparison. I certainly think that hybridized ICE drivetrains will become much more popular in the future. More about this in the follow-up article. The oil price vs. electricity price comparison graph includes costs of refinement and distribution, so it is a fair comparison. So you say that EVs have no emissions regardless of the power source? Sorry, but that argument is so senseless that it does not even merit a rebuttal. 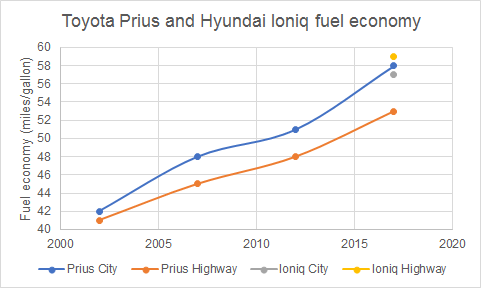 To give you a real-world example of the potential future efficiency of ICE vs BEV: the highway efficiency of the Hyundai Ioniq hybrid and electric versions is 59 and 122 mpg respectively (highway numbers are used because future traffic flow will become much smoother and most city driving will be replaced by carless mobility options). Accounting for 10% charging losses in the EV brings the effective electric mpg down to 110 mpg. In other words, electric drive is currently only about 1.86 times more efficient than efficient ICEs. And ICEs have much more headroom for further efficiency improvement than electric drive. Hence the range of EV efficiency advantages from 1.5x to 2x included in this article. A life-cycle assessment should cover four distinct phases of a vehicle’s life, and be based on driving, say 150,000 km (93,750 miles) during the 15 years of a vehicle’s life, using 10% ethanol/90% gasoline blend (E10), and a grid CO2 intensity of say 500 g CO2/kWh, or 1.10 lb CO2/kWh. 4) Fuel production and delivery processes of electricity generation and gasoline production, depending on vehicle type. The embedded greenhouse gases of average vehicles, as a percent of the lifecycle total emissions, in metric ton, are shown in below table. See URL and click on press release. The best reason for public tax dollars to subsidize mass conversion to EV’s: urban air emissions and the public health benefits of removing automobile air pollution out of the cities. It is far easier to contain the emissions from one big modern coal plant outside the city needed to feed the urban electric grid than thousands of autos. Second, hybrid EV’s offer huge efficiency gains for heavy use vehicles by being able to shut down the ICE while idling or doing lite work, which is where conventional ICE trucks have their worst fuel efficiency and worst emissions. Think: idling truck diesel trucks in poor parts of any big city making clouds of pollution, can be eliminated with hybrids. Third, electric drive trains are awesome to drive, and offer the ability use individual, computer controlled motors on every wheel, and driving capabilities never before dreamed of with mechanical drive trains, like a high-speed 360 while staying in your lane. There are a hundred reasons to love EVs that have nothing to do with net energy use or CO2 emissions. You’re assuming that PHEV drivers wouldn’t be minimizing their fuel consumption under normal circumstances. The difference for the USA would come from elsewhere. I’ve found that it’s fairly easy to cut fuel consumption by 2/3 or more over an ICEV (it would be easier yet if charging was supported more widely). Translated fleet-wide this comes to more than 6.2 mmbbl/d, which is more than the sum of net US petroleum imports and the processing gain. Wiping out net imports would make the US nearly immune to disruptions in overseas supplies. Yes, there are suggestions all over the internet that many manufacturers sell their electric cars at a loss. It is difficult to get hard numbers on this because EVs are such a small fraction of most car companies that it does not really impact the overall financials. Tesla, as an EV-only manufacturer, runs at a gross margin of about 25% and predictably ends up with large net losses at the end of every year. The Model S and X need to sell at a gross margin of about 50% (e.g. Porsche) for long-term profitability. This means that Tesla investors currently subsidize Tesla buyers to the tune of $15000 per car. Add this to the $7500 federal tax credit, the $2500 state rebate, and about $5000 in ZEV credits and avoided fuel taxes and you end up with $30000 per car in subsidies. The scary thing is that this is substantially more than the claimed cost of a Tesla battery pack. Future battery cost reductions can therefore not compensate for the eventual end of subsidies, implying that EVs will struggle when current inefficient technology-forcing policies eventually fall away. * New electricity production is likely to be cleaner than incumbent. When EVs introduce more electricity demand, it will create some additional pull for clean power. The marginal power provided for EVs should be a lot cleaner than average. * EVs have advantages in driving experience, handling and robustness that make some or a lot of buyers willing to forego a large, powerful and thus inefficient ICE for a smaller, sleeker (and even more powerful, but not wastefully so) EV. So I dispute the idea that EVs should be compared with the most frugal ICE you can find. Quite the contrary. The Tesla Model S/X buyers would largely not have gone for frugal ICE cars, and at mass adoption, the same likely goes for the average buyer. * I think the city air pollution advantage was kindof glossed over in the analysis. Even if a lot of emissions are not tailpipe, the tailpipe emissions are where people are, and thus they are far more important from an air quality perspective. And here, too, it’s not a good idea to compare pure BEVs to a new, perfectly tuned Priuses. With ICE cars, there will be a lot of cars that have overpowered engines that aren’t optimized for low emissions, and many of them will have some problems that make them emit far more soot and stuff than they should according to specs. With BEVs, it’s always zero tailpipe. * I disagree that we can’t afford bad energy investments. We absolutely do. * Missed the other costs of ownership. A BEV is simpler and more robust, giving less time in repair shops and less money for maintenance and drivetrain-related insurance costs. A hybrid (at least currently) increase the complexity compared to a standard ICE. * Disagree about the folly of transporting ourselves. With autonomous drive, doing so will be more attractive since you’ll be able to work (tele-commute while commuting), sleep or socialize while en route, so travelling will be less of a pain and it will be cheaper, so we’ll do far more of it, not less. To curb this increased demand would require quite impopular laws. So we’ll remain in need of a no-tailpipe-emissions solution. * The endgame for autonomous electric drive is unclear. They might start to electrify major arteries (inductive charging from the roadways), use batteries that can be switched out automatically, or have smaller cars aggregate people to rail or ICE buses for longer-distance transport. In other words, electric drive is currently only about 1.86 times more efficient than efficient ICEs. And ICEs have much more headroom for further efficiency improvement than electric drive. You’re ignoring the potential for improvement elsewhere in the EV chain. An ICEV, hybrid or otherwise, must run on a fuel of some kind. Save for hydrogen and ammonia, these all contain carbon and produce carbon emissions. Efficiency of ICEs may have tripled in the last 40 years, but they are far into diminishing returns; perhaps another 30% is possible, at high cost. Even if there is NO improvement in the EV from here on out, improvements upstream can and will cut what ultimately comes out of “the long tailpipe”. The best CCGT plants are achieving 330 gCO2/kWh emissions. If this electricity charges an EV at 90% efficiency to the plug and 100 MPGe (337 Wh/mi), the net CO2 emissions come to 124 g/mi or 73 g/km. The 55 MPG Prius emits 162 grams/mi. If the EV charges from wind or nuclear electricity at 15 gCO2/kWh, its emissions fall to 5.5 g/mi or 3.3 g/km. The Prius will never be able to get close to such numbers. My article shows a high-efficiency hybrid, such as a Prius, will beat an EV in energy consumption and CO2, on a life cycle basis, PLUS the hybrid is a lot less expensive, and requires no major retooling of the industry, and requires no subsidies. The EV hype is totally at variance with reality. once renewables becomes more of the norm than your projected slow shift, your figures becomes of no consequence.. wind power prices in ireland is already lower than nuclear.. If you were an engineer, you would know that that is totally irrelevant. “Renewables” (meaning the unreliables, wind and solar) could be free and you would still need some other source which can be stockpiled to maintain reliable delivery. In the absence of hydro, the fallbacks are (scarce and environmentally damaging) biomass and then… back to fossil fuels. Even at fire-sale prices for surplus RE, electrolytic hypedrogen is projected to be at about the same energy cost as natural gas at the 2008 speculative peak (in excess of $12/mmBTU). You can use subsidies to create zero and even sub-zero sales prices for “renewable” electricity, but you cannot eliminate the costs and emissions from the system. You can only change who pays the cost and takes the blame. Seems the only thing that will move ICE efficiency technology forward is if fuel cost are high enough. In that case, it’s likely that the cost of gasoline/liquid fuels will go up much faster than the cost of electric grid/DG fuels. At the same time it’s very hard to predict how these high tech efficiency improvements will affect cost, maintenance and life of vehicle compared to the simplicity of electric drive trains. Very good point. I recall what happened to solar hot water collectors after Carter left office. The third and final article in this series will look into the future of sustainable clean fuels, focusing more on a long-term timeframe that aligns with the near zero-CO2 electricity scenarios you mention. The fact is that, currently, a Prius is cleaner than an EV fueled by the global average electricity mix. And unless a true technology-neutral climate change policy framework is put into place relatively soon, this will be the case for several decades into the future. Firtsly, I fully agree that EVs will grow nicely in the future. There are certainly short-distance applications where an EV can make economic and practical sense. As an added benefit, this will break oil’s total monopoly on the transport sector. It is just that the total disruption of the ICE that many people are predicting is not going to happen. This disruption idea is an important argument for the very expensive subsidy programs that are almost fully responsible for current EV sales. Here in Norway, people get about $100000 in tax breaks when buying a fully loaded Tesla – a horrible sustainability investment. Sure, EVs can get low electricity prices in current baseload systems, while they represent only a tiny fraction of the vehicle fleet (although I have not heard of something as low as 2.5 c/kWh yet). In the future, more wind and solar will make it much more complex to charge during low-price periods and more EVs will increase demand (and prices) in those periods. When you compare the 5-year operating cost of the Prius and the Leaf on Edmunds.com, the Prius is about $450 more expensive to maintain (over the entire 5 years), but saves $800 in insurance costs. As stated in the article, fuel costs between an and an efficient ICE car are quite similar. Agreed on most of your points. As pointed out in the article though, tailpipe emissions from efficient ICEs are very low. The longer term future will also see more and more movement away from the ridiculously inefficient single-person-in-car short-distance mobility norm of today. These two factors make local air emissions a non-issue even if ICEs are still used in a sizable fraction of cars. Strong acceleration (and doing high-speed 360s) may be a determining factor for a small fraction of buyers, but most people just want low costs and practicality. For a large portion of the mobility market, EVs will struggle to compete with ICEs on these measures. It is useful to look at the last graph in the article, keeping in mind that current subsidies cover the entire battery pack cost of the Bolt (more than the entire battery pack cost in affordable offerings with smaller ranges). Your first point is an interesting one. But if you want to assign the cleanliness of new marginal generating capacity directly to EVs, the high cost of new, clean marginal generation must also be assigned directly to EVs. In practice though, at least initially, EVs will allow baseload (mostly coal) plants to operate more at night, leading to high emissions. Sure, as I say in the last sentence of the article, EVs will do well in the performance/luxury segment. In the next article, I will also speculate more about future hybrid options where the electric motor is substantially larger than the ICE to capitalize on the benefits of electric drive under rapidly variable load. About the tailpipe emissions, I still maintain that affordable EVs are primarily marketed as clean planet-savers. They should therefore be compared to ICE options that are marketed as clean planet savers. And I’m pretty sure that city air quality would be of very high quality if everyone drove ICEs marketed in this way. About energy investment, I think a decade or two from now, we will look back and wonder what we were thinking with all of this technology-forcing that avoids CO2 at massively high costs. It is kind-of like smoking: seems affordable in the present, but, in hindsight, generally shows itself to be unaffordable. In the next article, I include two links from Edmunds.com showing that a Leaf costs $450 less in maintenance than a Prius, but $800 more in insurance over 5 years. Thus an essentially negligible cost differential. My hope is on hybrid drive where the electric motor is substantially larger than the ICE. Such cars could eventually become cheaper than pure ICE cars, will be more fun to drive (due to the instant torque of the electric motor) and will of course have much better mpg. The next article will discuss this possibility in more detail. I can live with assigning the costs to whatever. Charging at night from coal, yes, perhaps, if you don’t drive to work, plug it in and charge from solar/gas somehow. I’m a Swede, though, so it’ll support nuclear here, for now. Sure, as I say in the last sentence of the article, EVs will do well in the performance/luxury segment. Agreed, so why compare with Prius? I think urban air quality will become increasingly important, especially now when there are alternatives. To my mind, marketing that portrays ICE as as clean planet savers is false. I already wonder what we are thinking when it comes to clean investments, but I don’t kid myself that we can’t afford it. Btw, exactly that argument is used by solar activists when I suggest the US should invest enough in nuclear to revive and mature its supply chains, so that you can build cheaply: “We can’t afford wasting any more money on nuclear.” That’s nonsense. Even at 10 BUSD a piece, nuclear would decarbonize the US grid for 0.2% of GDP, minus the current costs whatever that is. When it comes to autos, the average sticker price for new US autos is around 35 KUSD if I google correctly, and that’s pretty much what the Bolt and Leaf costs. a Leaf costs $450 less in maintenance than a Prius, but $800 more in insurance over 5 years. I don’t understand why it would cost more in insurance, and I think electrics are overcharged for service and repairs. I’m assuming this will adjust itself as competition intensifies. There are always arguments like this that attempt to explain why a certain technology will not reach its potential in the marketplace. As it is with this one, metrics of great interest to scientists and engineers are used to support the case – metrics about which the market and consumers could care less. An electrified road for major trucking highways could work, but I wouldn’t see it practical for every street. The 350kwh dc fast chargers are starting to become available and they are working on 1mwh fast charger standard. Batteries prices are falling and I would expect battery density to 2x by 2025 at the very latest, and possibly charge a lot faster and of course cost less. so the current range would be doubled with the same weight/space. Your article is about wasting money on RESEARCH. The money is spent for the vehicles being designed IN THE FUTURE. Vehicles manufactured in 2025 will meet NONE of the characteristics you present. Many of your facts are wrong even if based on current BEV’s, but investing in the future is the ONLY path forward. We have no choice if we want to survive. This is a flawed assumption, a fallacy know as apples-to-oranges, because in fact not all EVs are compact sedan-hatchbacks, and not all have the same driving performance and passenger/cargo utility as simply “vehicles are built for maximum efficiency”. Also, saying “pushing 60” may be a real world best case driving for the hybrids, but none of them are actually EPA rated at 60 mpg (a base Prius is rate at 52 mpg combined EPA, and a base Ioniq hybrid at 55 mpg EPA). EPA ratings of EVs should not be implied to be compared to real world numbers for special case drivers. Both should use EPA and the actual numbers should be compared, not rounded up or down for purposes of exaggeration. So this is another example of a apples-to-oranges flaw in methodology. Vehicles’ efficiency should be compared to other vehicles of similar size utility, and performance, not simply the very best compact hybrid to an average EV, just because they are both using efficiency as one of several design parameters. Bottom line: If one is going to cherry pick the MOST efficient hybrids in its class, they should be compared to the MOST efficient plug in electrics in the same class, with the same or very similar driving performance…because size/weight AND performance all also all factors that determine vehicle actual efficiency. Also, one single vehicle or class can’t be cherry picked as a source of authoritative data for drawing conclusions: “comparing the fuel costs for the Hyundai Ioniq hybrid and electric versions shows only a small advantage for the electric car (which is $5000 more expensive with a battery pack of only 28 kWh).” and presented as Representative of an average or typical vehicle. Also, since federal and state incentives do exist for these vehicles, those need to not be completely ignored in the analysis or it is again, a cherry pick. Schalk, with ICEs a commitment to carbon reductions happens one driver at a time. With EVs it happens millions of electricity consumers at a time. So whether EVs are dirtier than your average hybrid, right now, is irrelevant. Assuming grid mixes will continue to get cleaner, so will the EVs charged by them. ICEs already in service always, unfailingly, predictably get dirtier as they age, and though efficiency of new models will improve, it is ultimately limited by the Gibbs free energy of hydrocarbon fuels. An EV charged by nuclear electricity is for all practical purposes GHG-free from “well to wheels”, and will always be. A part of it must be an $8000 price difference, Leaf more than Prius, which carries more insurance cost, and subsidies don’t reduce insurance. MIT’s 2015 “On the Road Toward 2050” report favored PHEVs with more than double the growth rate of BEVs going forward. IIRC, they find the major obstacle to BEV mass adoption was charging time compared to the 4-5 minutes required for liquid fueling. This is why I think the PHEV is poised to sweep the market. Recharging time becomes irrelevant to your mobility; it only affects your savings, and the battery cost can be 1/4 to 1/10 that of a pure EV. My point is that assignment of the high costs of new clean generation to BEVs may well push their fuel costs higher than an efficient ICE vehicle. The Prius is a mass-market car and a good benchmark for potential mass market BEVs. The luxury/performance segment is essentially insignificant when we are talking about global sustainability challenges. Personally, I think a good hybrid like the Prius or the Ioniq is about as clean as we need to go. Local emissions from these cars are about an order of magnitude less than many older cars that are still on the road. 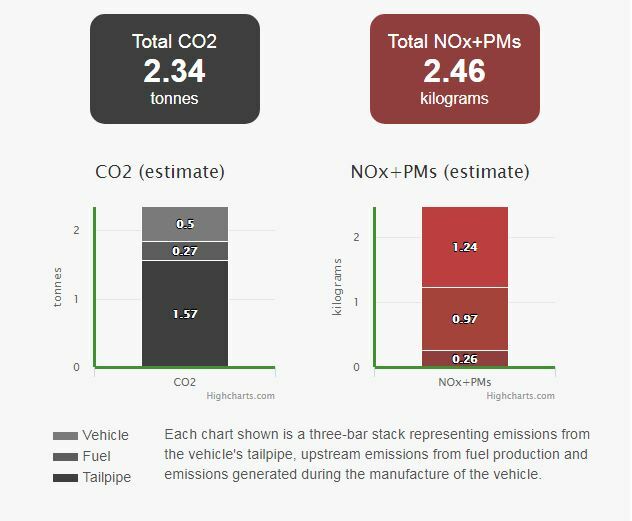 Following such a large improvement, tailpipe emissions become a minor element next to PMs from other sources such as tire, road and brake wear and resuspended road dust. I fully agree that the minority of global citizens who were lucky enough to be born into world regions that have already been built by fossil fuels can afford clean technologies. My concern lies with the bottom 80%. According to the latest global wealth report, the bottom 75% of global citizens control a mere 2.5% of global wealth – quite a staggering statistic.These people will be most affected by climate change effects and cannot afford expensive clean energy technology forcing. About maintenance costs, the nice thing about hybrids is that the ICE can operate under much more steady conditions. This greatly reduces wear. Given that all the other parts on the car aside from a small, steadily operating ICE and transmission are essentially the same between an EV and a hybrid, overall maintenance should be quite similar. The other important cost in BEVs is of course an additional loss in resale value as the range reduces from gradual battery degradation. Regarding wealth statistics, I kindof hate those. Globally, humanity consists mostly of fairly young people, and those can live a fairly affluent lifestyle yet have no discernable wealth. They’ll typically be in debt until their 40-ies when they start to accumulate some significant reserves. And I think the success of electric bikes and scooters in poorer Asian countries is telling us something: Electric drive is very simple and cheap. Only major issue is the price/range tradeoff. The decent Prius Prime with 8.8 kWh battery has a starting MSRP of $27k. That’s not far from the 40 kWh Leaf’s starting MSRP of $29k. The Ioniq hybrid only has a 1.56 kWh battery and that’s far from good enough. I kindof agree with you that in theory, good hybrids could be good enough (given that the battery is dimensioned so that the liquid fuel use is cut to 10% or so). However I doubt that they provide a good long-term trade-off between range and cost in a broad sense. With a smaller battery, which is the point of having a hybrid, you have to plug it in more often, and as soon as you forget, you go ICE for the next trip. Then the reduction to 10% is only theoretical. Also, with a smaller battery, each kWh will be cycled many more times which will reduce the life expectancy for hybrids faster than for pure BEV. And I suspect battery cost reductions will make hybrid drivetrains obsolete in the late 2020-ies. $100 is by no means the end of the road. In practice, in the US, we’re talking about fracked gas extended by decently cheap wind and solar. I don’t think that push fuel costs anywhere much. The gas contribution to AGW will still be too high, but that’s another topic. The factor missing in the comparison is time. There is little chance for a prius to lower it’s emissions and to improve it’s economy on the ICE-side significantly. these parts have mainly reached their limits, being in development for more than a century. On the BEV side, battery for cars are at the beginning of their development in many aspects (not all) and their economy of scale, which influences economy, and the likelyhood for the electricity generation to become mor CO2 intensive is much smaller than the likelyhood that it will become less CO2 intensive ith the givbel low costs for renewables. Tings are nearly in balance today, even with a more frugal Prius as ICE-hybrid car in the comparison. And it the balance is likely to shift more and more in favour of the BEV. I checked it out on edmunds.com. I can’t corroborate Schalk’s claim that the Leaf has more expensive insurance. Agreed, as I’ve shared in multiple articles before, I’m very much in favour of small electric vehicles. I think they are (and will be) doing great things for global development. Well, this article does not talk about plug-in hybrids, only conventional hybrids. Personally, I think conventional hybrids have great potential as will be detailed in the next article hopefully coming out on Monday. Wait, what? Don’t you see the same figures I do? Clicking on those links the Prius 5-year insurance total is $4,215. The Leaf is $4,097. So the Leaf is $118 cheaper to insure. They have maintenance and repairs separated, and for some reason the repairs estimates are exactly the same. But I would assume Leaf repairs are cheaper over time. Perhaps no big difference in the first five years, though. Most should be covered by the warranty. As a researcher, the last thing I want to do is to cut research funding. I wholeheartedly support R&D on batteries and electric drivetrains. The thing I am opposing in this article is technology-forcing of BEVs (i.e. bureaucrats picking winners and losers in the market through taxpayer money). Research spending is a small fraction in comparison to the direct and indirect subsidies and tax breaks pushing current BEV sales. Technology-forcing policies are very inefficient in avoiding negative externalities and also lead to disruptive boom-bust cycles. 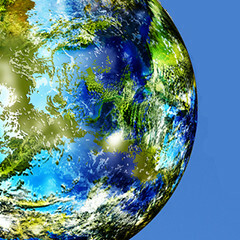 We sorely need much more efficient technology-neutral climate and environmental policies (e.g. a CO2 price). For most of the long development of the ICE, power has been the main priority. Recently, emphasis has shifted to efficiency and some substantial improvements have been made (and will continue to be made over coming decades). One should also not underestimate the potential of low-carbon fuels for reducing future ICE emissions. The third and final article in this series takes a look at this topic. It should be out in about 10 days’ time. Schalke, EV charging losses already fully factored in to all EPA MPGe ratings. Were you not aware of this? That means you are double counting them for PEVs, That is an obvious data and methodological flaw in your analysis you should correct, peer review or not. Otherwise, it’s junk science you present as scientific analysis. So by mixing current state efficiency with future state efficiency predictions in the same analysis, you are again cherry picking your data, rather than letting currwnt real world data and assumptions shape the conclusions. You really need to go back to the drawing board on this piece, or issue a follow up, as this one only harms your own credibility. I suggest you partner with an actual professional vehicle emissions scientist. Most cabs are not moving at anything close to highway speed the majority of their hours. A Tesla with a 250-mile range would be able to drive 10+ hours in a place like NYC and then spend 1 hour off-line to charge, especially if that hour was in 20-minute segments after fares. 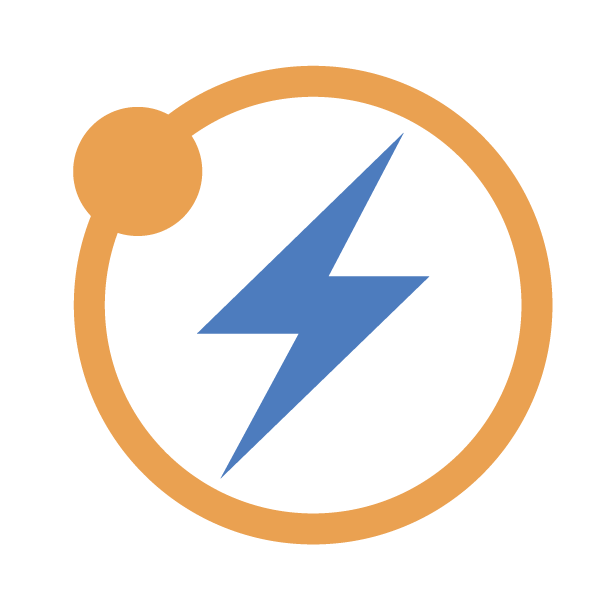 Fast-charging during short interludes would massively improve the availability… if fast-charging was available without significant difficulty. This really isn’t a hard problem. The problem is that the average EV buyer has to be paid about $15000 in direct and indirect subsidies to make this commitment. Even with this large payment, much fewer BEVs are being sold than regular hybrids (which are arguably slightly better for the climate). The CO2 avoidance cost math with this BEV technology-forcing just becomes horrendous if you use efficient ICEs as the benchmark. Sure, BEV costs and electricity CO2 intensity will gradually reduce in the future, but the global average CO2 avoidance cost relative to hybrids will remain enormous for decades to come. The next article in the series will speculate on how hybrid drivetrains will capitalize on improvements in electric drive technology to keep the ICE highly competitive. In the long-term, one should not discount the potential of low-carbon sustainable fuels. This will also allow exising ICE cars and trucks to gradually decarbonize. Although, at that point, it could be that vehicle utilization rates are much higher, shortening the vehicle lifecycle. Your stance is very close to what Finnish policy on transportation is trying to achieve. The source I have given is a bit out of date…in a positive way. As far as I have heared from car manufacturers here in germany the fuel efficiency of the engine is not likely to go up significantly in the futre, since this point was in the focus for decades now. A few percentages maybe, but no substantial improvements. I am not a specialist to this topic, but this is repeated from several directions, so it is likely to be true. What about hidden cost of hybrids like CO2 cost of hybrid repair and maintenance? Ultimately the TCO of a pure BEV can’t be beat anyways. Why would you opt for a hybrid when it is all the trouble of the ICE? We have seen hundreds of technology transitions follow a pattern (only interrupted, but continued after, a crysis like WW2). It takes the lifecycle if the obsolete product to replace it. 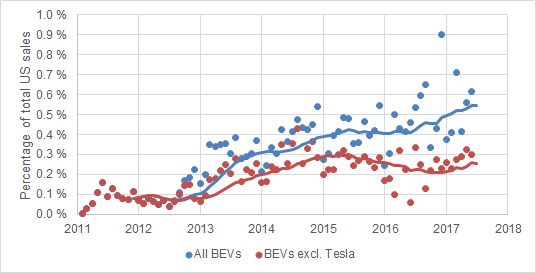 With BEVs starting in 2011 with the Leaf, the cycle could be completed by 2026. Yes, you are right. Luckily, this 10% error is not directly included in the calculations in this article, but I will keep it in mind for future articles. Thanks for pointing it out. Although it doesn't seem like there are that many electric vehicles on the road yet, Duke Energy is getting ahead of the curve in North Carolina. It will invest $76 million in the program and also provide incentives to customers. A recap of major utility players building electric charging stations. Duke is among the most prominent players. German car manufacturer Volkswagen has already committed more than $2 billion to the effort through Electricify America and Plug into..
Power utilities are uniquely positioned to capitalize on expected rapid growth in EVs and e-mobility in coming years. They need to act now if they're going to emerge as market growth drivers, however, according to Accenture Strategy.